Para mi, no hay mejor manera de celebrar nuestra mexicanidad que a través de algo tan maravilloso de nuestra cultura como es la comida. Les comparto un par de vídeorecetas que publiqué junto con México Desconocido (la mejor revista para viajar por nuestro país) con motivo de las fiestas patrias. Me encantó esta receta de pozole por ser tan ligera, sencilla y al mismo tiempo, llena de sabor. Lleva menos condimentos que otras versiones de pozole verde y aun así, el sabor es espectacular gracias al carácter único que le da la hoja santa. Se hierve el agua y se pone a cocer el maíz con dos dientes de ajo, la mitad de la cebolla y el laurel. Diez minutos después, se agregan las pechugas de pollo y se dejan hervir 15 minutos más o hasta que le grano de maíz esté reventado. Mientras se cuece el maíz, se desvenan las hojas santas y los chiles (se pueden dejar los chiles enteros para que el pozole sea más picoso) y se muelen en la licuadora junto con la cebolla, dos dientes de ajo y un chorrito de agua (solo la necesaria para que se pueda licuar). Cuando el maíz esté cocido, se retiran el laurel, la cebolla y los ajos, y se dejan enfriar las pechugas en un recipiente aparte para poderlas desmenuzar. En una olla o cazuela se fríe la mezcla de hoja santa y se agregan los granos de pozole junto con el caldo y el pollo desmenuzado. Se deja hervir y se sirve calientito con la lechuga, el rábano, la cebolla, el orégano molido, el chile piquín y el limón. Se acompaña con tostadas. Esta receta tiene unos cuántos desvíos de la original. La idea no es transgredir la tradición culinaria poblana sino proponer una versión más fácil, rápida y barata (pero igual de rica) para preparar los chiles en nogada en casa. Cada quien le puede agregar o quitar los pasos que quiera, el chiste es cocinar y festejar. Se cortan todas las frutas en cubitos. Se tuestan las almendras y los piñones. Se pican el ajo y la cebolla, y acitronan en un poco de aceite vegetal. Se agrega la carne y se sazona con sal y pimienta. Cuando esté bien cocida la carne, se reserva. En el mismo sartén, se agrega un poco más de aceite y se fríen las frutas, empezando por el plátano. Cuando las frutas empiecen a soltar los jugos, se retiran del fuego y se agregan a la carne, al igual que las almendras, los piñones y las pasas. Se revuelve todo y se deja cocinar tres minutos más a fuego medio. Se retira del fuego y se deja enfriar. Se licuan los quesos, la crema, la leche y las nueces en la licuadora. Para servir, se vierte la crema en el plato, se colocan los chiles encima, se rellenas con la carne y se cubre con la granada y nueces picadas. *También se costumbra agregar perejil picado a la decoración. Two very Mexican recipes to celebrate the Independence. Food is definitely one of the things that makes me more thankful of being born Mexican. So to me there is no better way to celebrate the Independence holidays than with two traditional dishes, which are found everywhere in the country during this season. Here are a couple of videos I made with Mexico Desconocido magazine for the occasion. There are many pozole recipes out there (even more than I expected), but I specially liked this one from Oaxaca cause it simple and at the same time full of flavor. 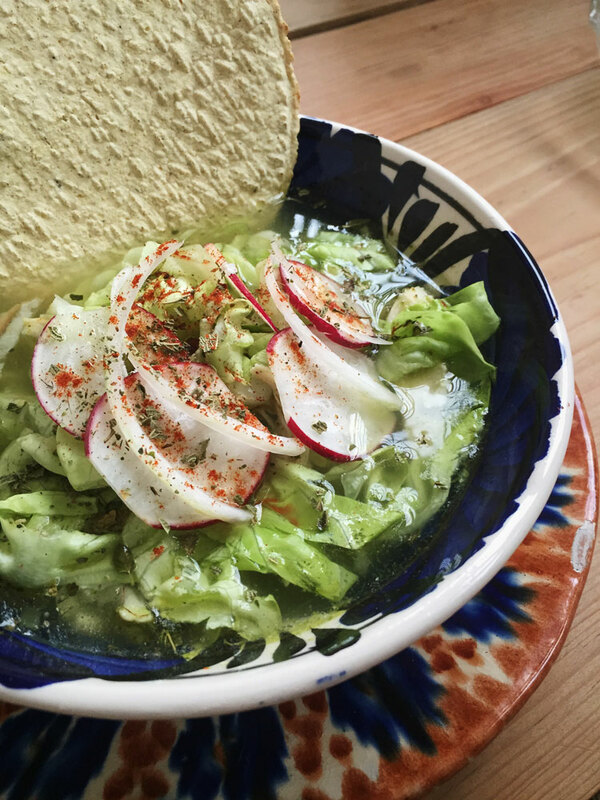 It actually has a lot less spices than other green pozole recipes, and it doesn’t need them thanks to the unique character of the hoja santa leaf. 1 k of pre cooked pozole corn. 2 l of water (more if necessary). 1 hole chicken breast (clean). Lemon, red powdered chili and dried oregano (to taste). Bring the water to a boil and add the corn with 2 cloves of garlic, half of the onion and the bay leaves. 10 minutes after, add the hole chicken breast and cook for 15 minutes more or until the corn starts to open. While the corn is cooking, devein the hoja santa leaves and the chilis (only if you want a mild pozole, if not you can keep them whole or only devein half). Blend the chilis, the hoja santa leaves and the rest of the onion with a little water if necessary. When the corn is ready tale out the bay leaves, the onion, garlic cloves, and put a side the chicken to be shredded. In a pot, fry the blend of hoja santa, onion and chilis, and then add the corn ant the broth. Season with salt and cook for a couple minutes more. Serve hot with shredded lettuce, sliced radish and onion, dried oregano, powdered chili, lemon juice, and tostadas on the side. Chiles en nogada (fast and easy version). 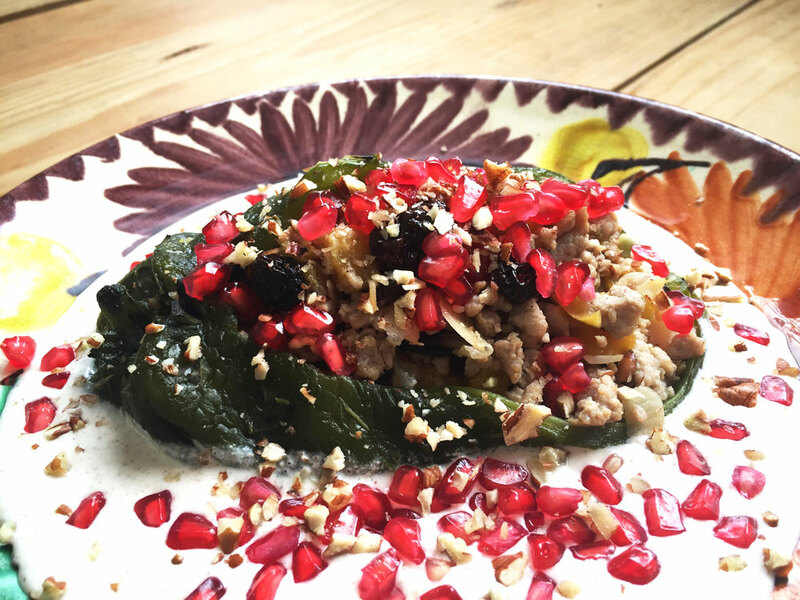 It is said that this recipe was originally invented by Augustinian nuns from Puebla, to greet Agustin de Iturbide after signing the agreement for the Independence of Mexico. The colors of the ingredients represent the colors of the Mexican flag: green, white and red. This recipe has a few short cuts from the original. Some people in Mexico (specially from Puebla) are a little touchy about this subject. Any little tweak from what each person considers the “authentic recipe” (which can vary from family to family) is some sort of a sacrilege. So, with no harm intended, this is my very own faster and easier version of chiles en nogada. 8 poblano chilies pealed and deveined (some supermarkets carry an already clean frozen version). A bunch of cilantro leaves (*optional, for decoration). *Acitrón (a candied fruit from Mexico) is a main ingredient for the traditional chiles en nogada recipe. For me, it is too sweet so I don’t use it. I prefer to add more fruit for a not too overwhelming sweet flavour. Cut the fruit in cubes. Toast the almonds and pine nuts and set aside. Dice the onion and garlic and caramelise them in al little more than half of the oil. Add the ground pork, season with salt and pepper and let cook on high heat for at leas 5 minutes (some water may come out, so get rid of it). Reserve the meat when ready. In the same pan, add the rest of the oil and cook the fruits starting with the plantains (when they are a little bit browned, add the rest). When the fruits star to let their juices out add the cooked meat and the dried fruits (almonds, pine nuts and raisins). Cook for 3 more minutes and put aside to cool (chiles en nogada are served cold). Blend the cheeses, whipping cream, milk and pecans (you can reserve some pecans and chop for decoration). Add the sugar and salt to taste. When the meat is completely cold, fill the poblano chilies. Serve cold and top with the nogada (cream, cheese and pecan sauce), pomegranate seeds, chopped pecans and parsley leaves.